Figure 1: Workshop model endband. Figure 2: Spine view of workshop model. 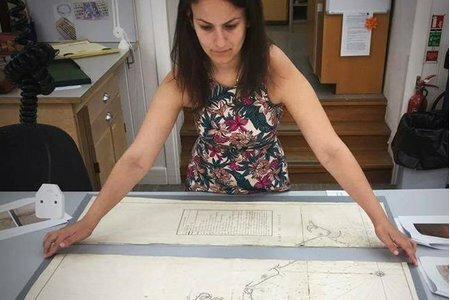 Earlier this year the Postgraduate book students made the long trek up to London for a four-day (over two weekends) workshop on medieval book structures. 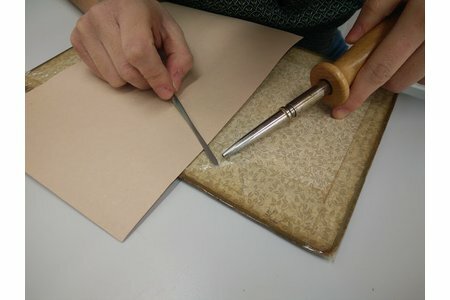 The workshop was led by Juergen Vervoorst, Head of Collections Care at the National Archives UK; one weekend was spent on the Carolingian binding and the other on a Gothic binding. We had an amazing time, but, as you can imagine (and even if you can't), this was a lot do in such a short amount of time. Therefore, we had to finish the bindings without the reassuring supervision of Juergen once we were back among the sheep. The only problem was that none of us could remember how to do the Carolingian endband. 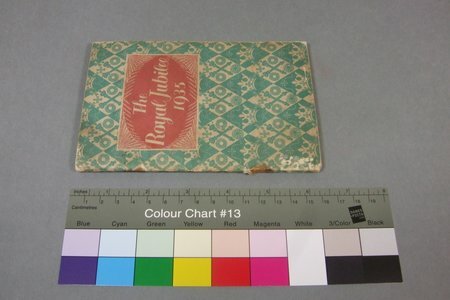 We tried looking it up and all we could find was one confusing diagram in The Archaeology of Medieval Bookbinding. That being the case, I sat down with my model and a picture of Juergen's endband and twenty minutes later had it figured out. Three weeks later, when I was asked to demonstrate it to someone, I realised that once again I'd forgotten how it was done. So, I sat down with a new model and ten minutes later I knew what I was doing. This time I decided to write everything done, to avoid future frustrations. 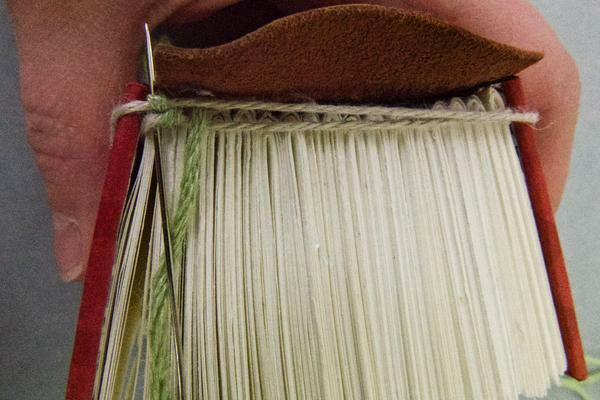 The following is a step-by-step tutorial describing the making of the 'herringbone' endband along with pictures of each step. There is a video at the end showing the entire process. 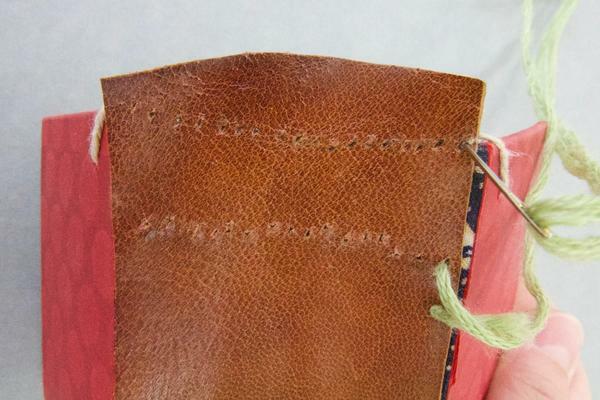 Once you have sewn your gatherings and boards together, pasted on the leather spine lining, and added the loop of thread for the core, it is time to sew this 'herringbone' style endband. 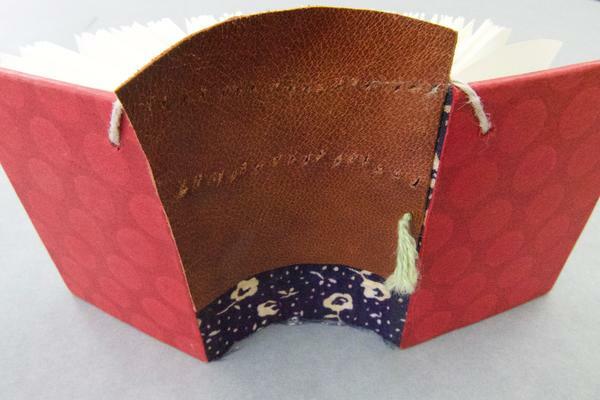 The sewing goes down into each section, which will allow the finished book to lay flat while giving the spine a gentle arch. This is a structural, but not integral endband. 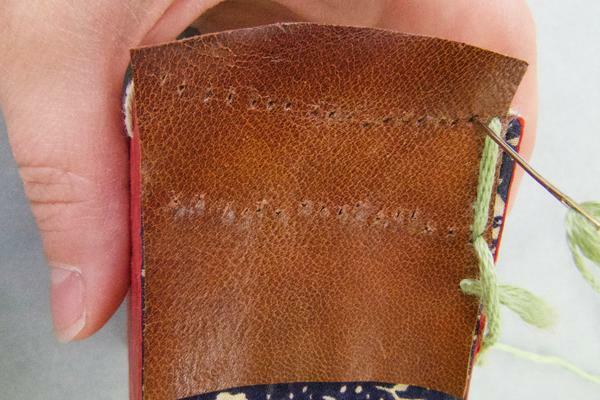 Step 1: (Optional, but strongly recommended) Pre-prick the holes in the leather with the sewing needle or an awl. This will make the whole process faster and make life simpler. Step 2: Knot the end of your working thread and, starting from the outside, go into the hole below the 1st kettle stitch, out the kettle stitch hole, and into the 1st mid-section hole. Step 3: The needle needs to go under the 1st core and over the 2nd core. 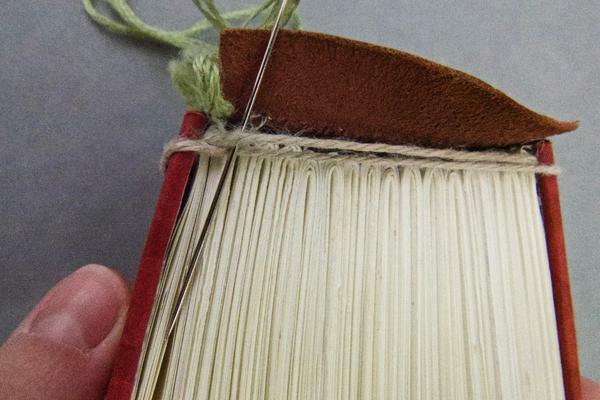 The thread should be fairly tight against the spine, but not when weaving in and out of the cores. 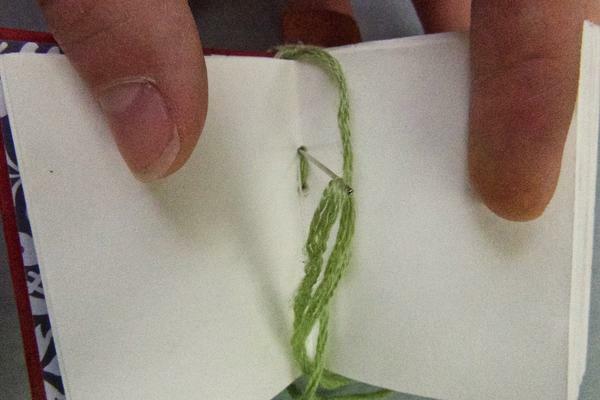 Step 4: Loop behind and pass the needle under both of the cores, pulling the thread gently into place. Make sure the 1st and 2nd cores hold their positions and do not switch places. 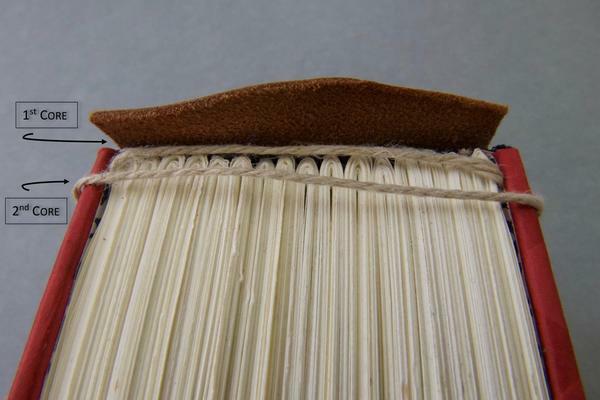 Do not pull the working thread too tight, as you want the endband to have as much volume as possible. It is this volume which will give the packed look you are trying to achieve. 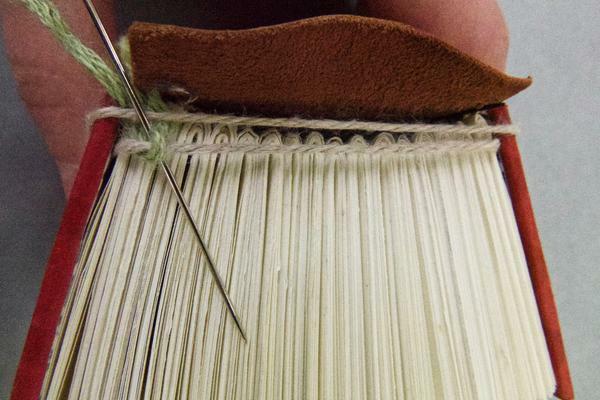 Step 5: Pass the needle over the 1st core and down between the cores, into the section. 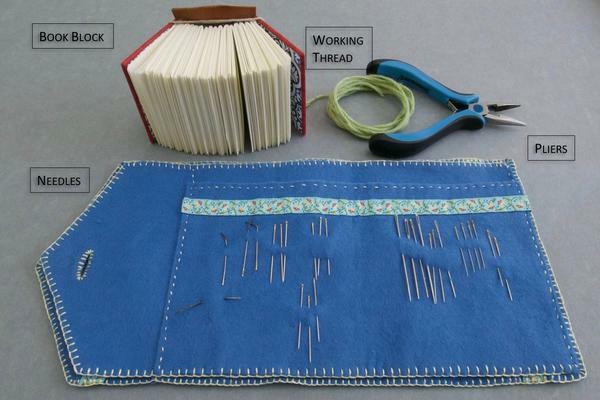 Make sure it stays behind the working thread from Steps 3-4. This was crucial for not getting gaps between the herringbone on the 2nd core. 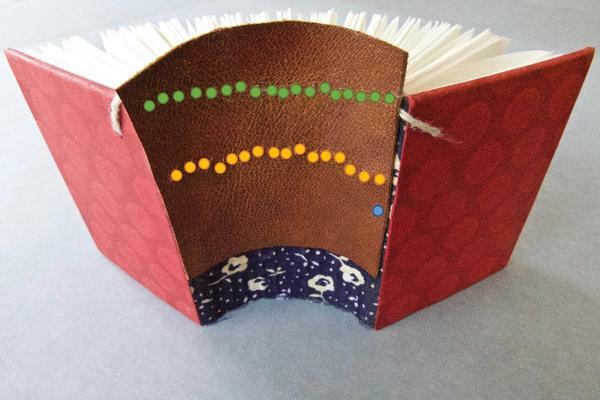 I do not think this would be necessary on books with thin sections (it wasn't for my workshop model), but for my model with chunky sections it was. 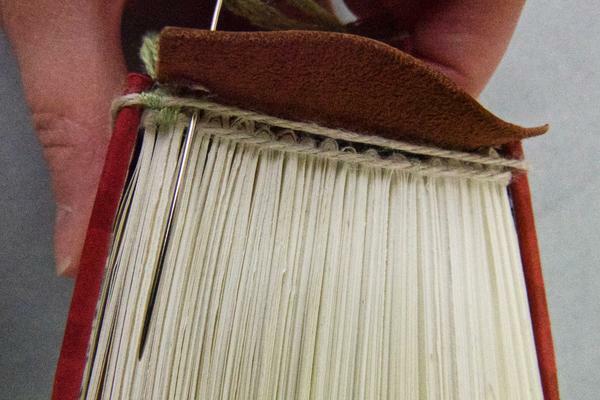 Step 6: Poke the needle out through the kettle stich hole and up into the next mid-section hole. 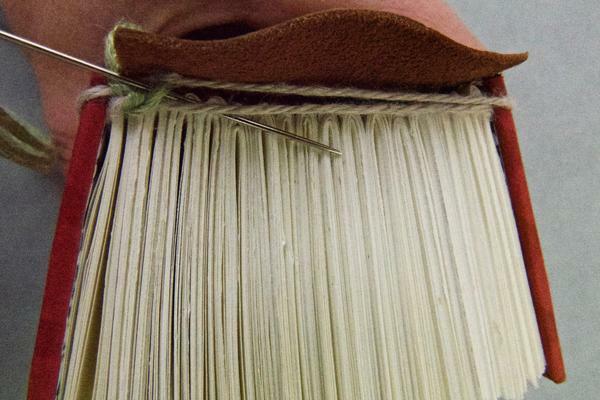 Step 7: Pass the needle under the 1st core and over the second just like in Step 3. 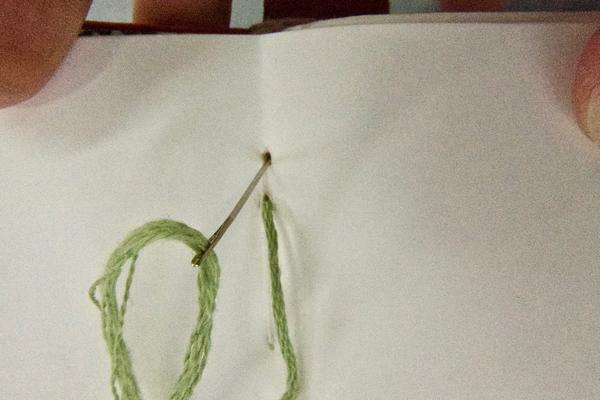 Step 8: Loop behind, passing the needle behind the working thread for Steps 3-6. 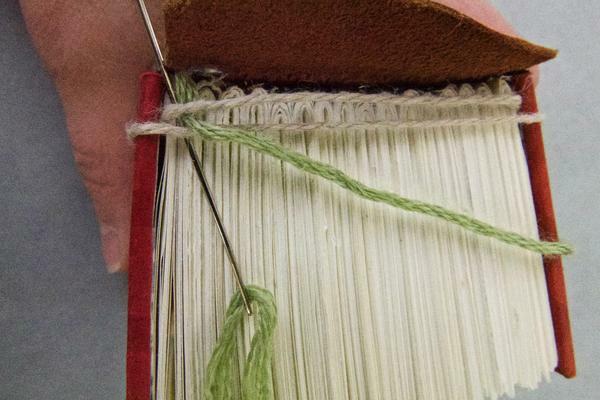 Step 9: Pass the needle over the 1st core, down between the threads and into the section, staying behind the working thread from Steps 7-8. 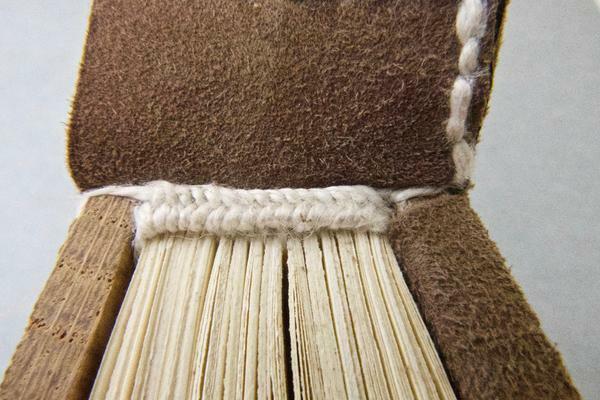 Finishing: Tie off on the spine after pulling the working thread through the last kettle stitch. 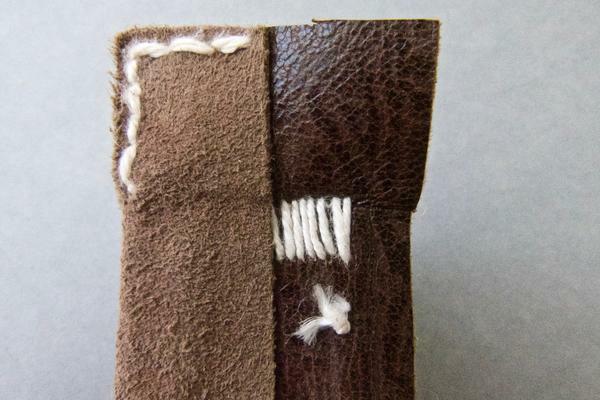 Or, if you are planning on using perimeter sewing to keep the stubs of the spine lining and covering leather together, you can keep the working thread in place and use that to stitch the two leather layers. Have patience and good luck! 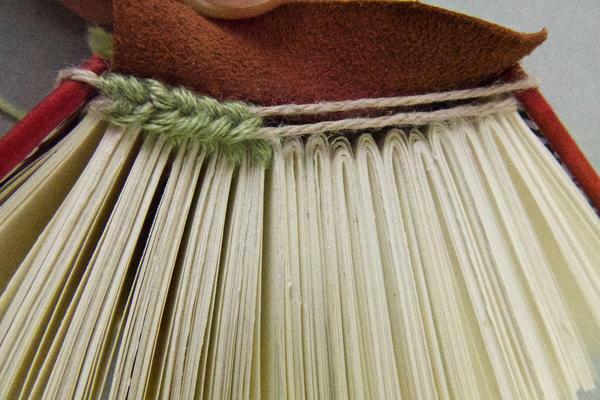 Repeat Steps 7-10 for each of the gatherings of the bookblock, always passing the needle behind the working thread from the previous section.